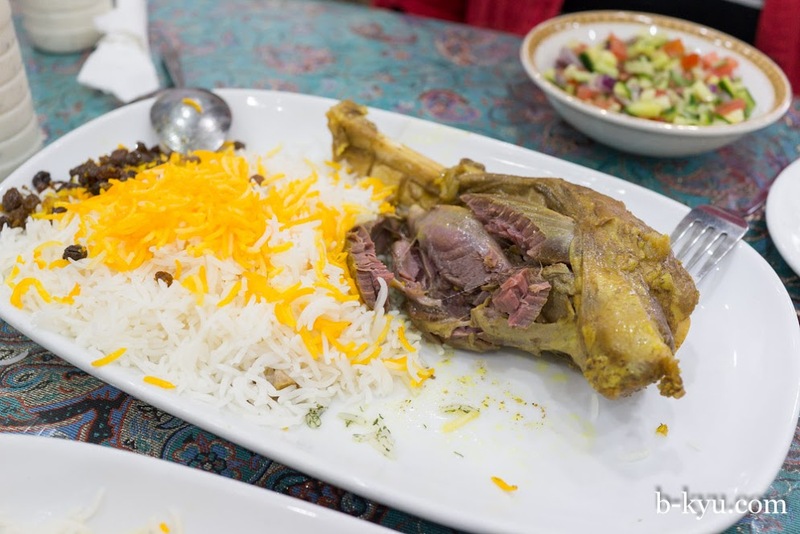 What is it about Persian culture? 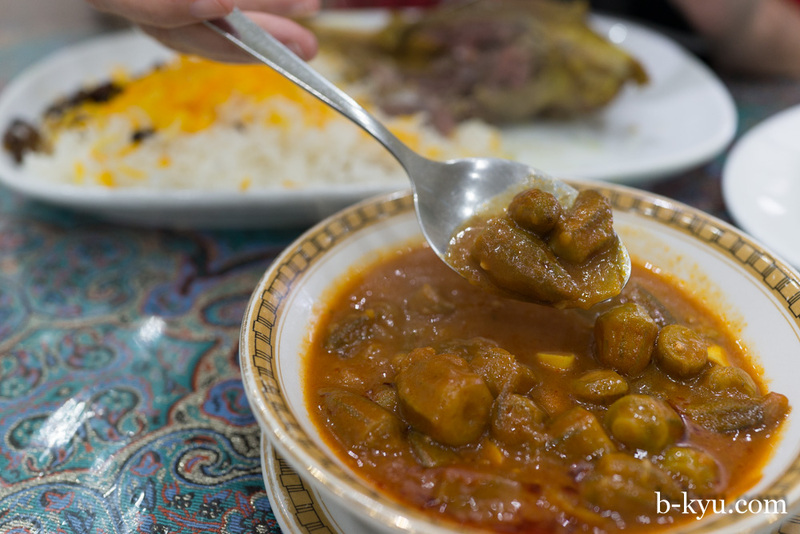 We're novices on the subject, all we know is that every Persian restaurant in Sydney is run by super lovely folks and full of super cheery customers that make you feel welcome. Match that with lamb, the fluffiest rice on the planet, flat breads and salad, what's not to like? 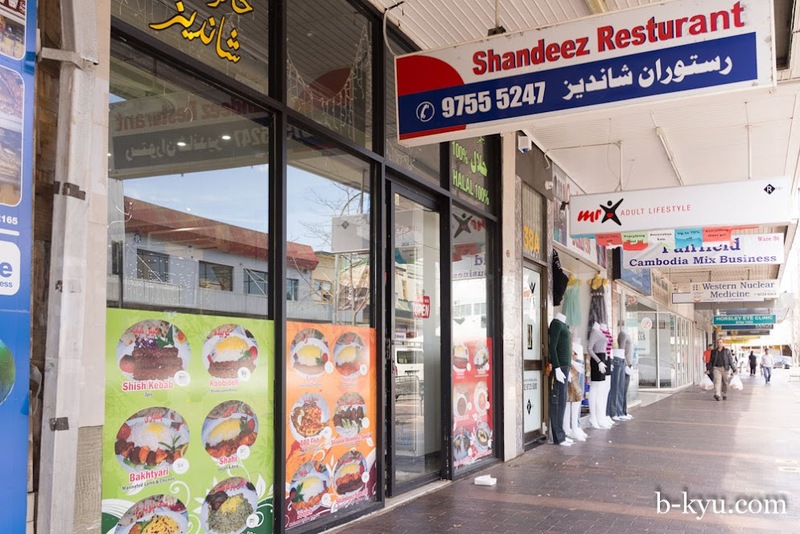 Shandeez has that upbeat Persian vibe and it's a nice space to boot, it's not fancy but it's very welcoming. 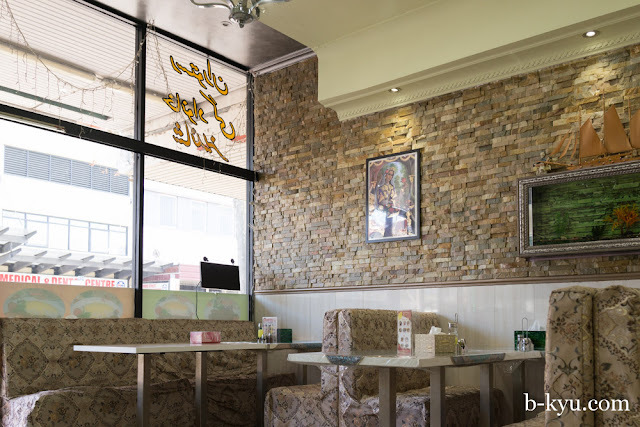 The comfy booths are covered in a chintz like fabric that gives it the feel of eating in the 'good room', and the walls are decorated with pictures that feature the Prophet Zoroaster (or Zarathustra) and other images of the Zoroastrian faith. For all non-Persians you'll be happy to know the menu is also in English with descriptions and with pictures, gotta love picture menus. 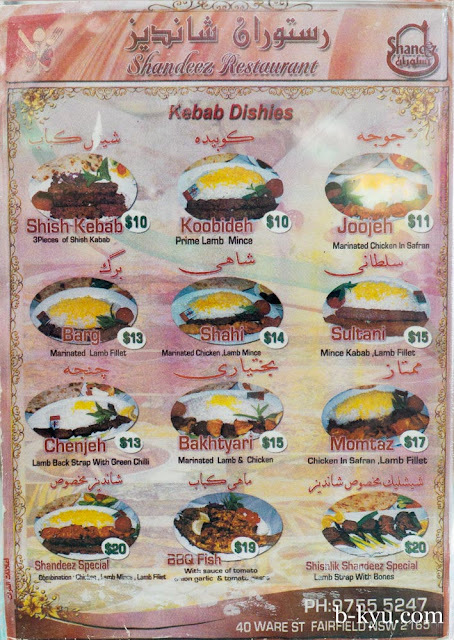 The food is excellent in quality and exceptional in value. As always. We've said it before and we'll say it again, some of the best food in Sydney is in the Middle Eastern restaurants of Sydney's west. If we are craving some grilled lamb it's the first kind of place we think of. When we find ourselves in some fancy pants restaurant we are always comparing it to these down home meals, wondering why we bother paying $19 for a shoddy burger on a wooden plank and a tiny presentation basket of fries when we can have a wonderfully satisfying dish like you get here. We insist you grab a yoghurt drink from the fridge. 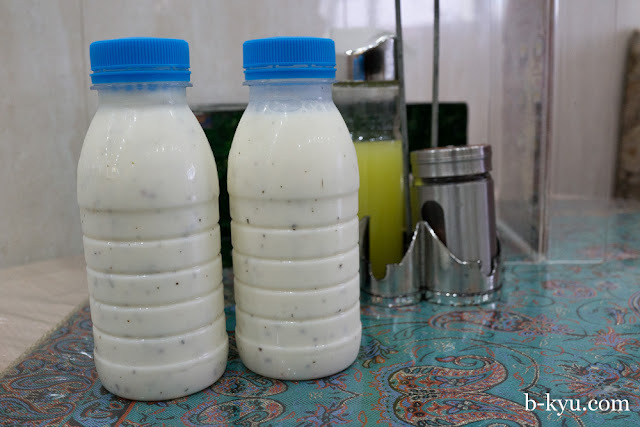 Wikipedia tells us the drink is called doogh, It's a little tart and salty like Turkish ayran, but it also has dried mint and it's slightly carbonated. These are insanely good. There's wonder in the mysterious art of fermentation which gives it a little fizz on the tongue and sharpness in flavour. Barg - marinated lamb fillet - $13. 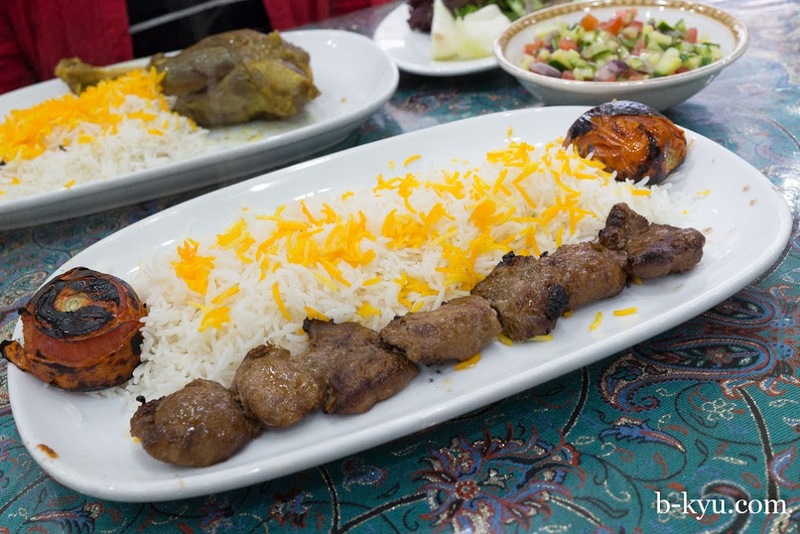 Hunks of tender grilled lamb, Wikipedia tells us barg is traditionally marinated in olive oil, onions, garlic, saffron, salt and black pepper, then skewered and grilled. It is served with buttered long grained rice and grilled tomato. 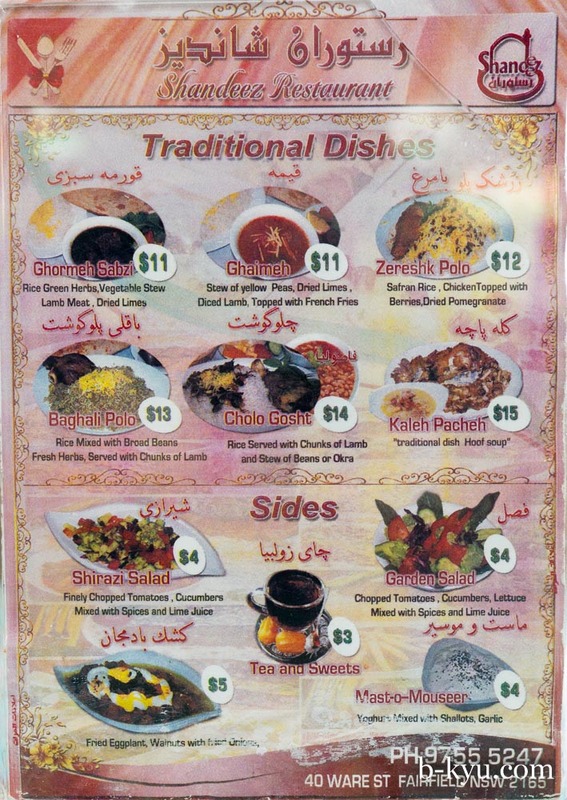 Cholo gosht - lamb chunks served with stew of beans or okra - $14. A hefty hunk of slow cooked lamb, so fall-off-the-bone tender we guess it was cooked overnight or pressure cooked. It had a natural, lamby flavour that wasn't overpowered by spice although the outside yellow showed it had been introduced to some flavourings, possibly some turmeric. This dish also comes with buttered long, long grained rice with the added bonus of a spoonful of raisins. 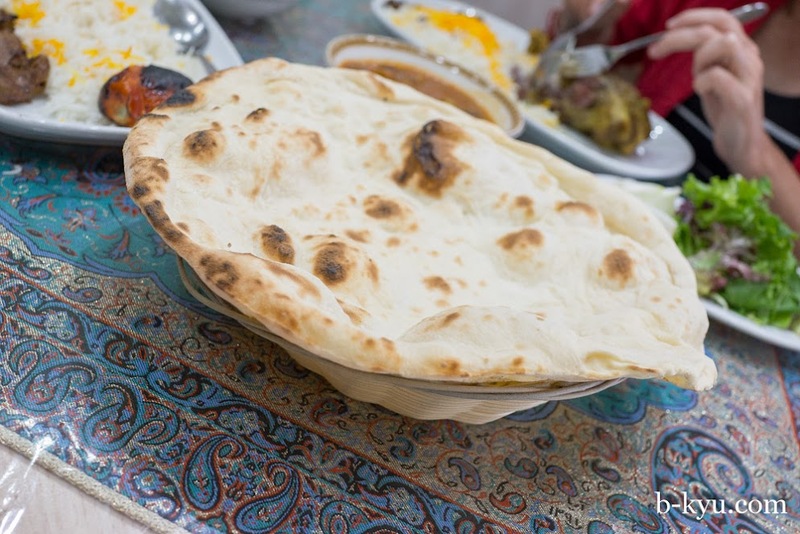 Persian rice is worth the trip alone, it's really something else. The okra stew that came with cholo gosht (or you can choose beans). A gentle flavoured stew of the tiniest little okra you will ever find with large chunks of garlic and a citrus flavour through it. A mix of stew, lamb, rice and raisins in a spoonful is magic. Bread comes with the cholo gosht, we think. It's warm and fresh. It's lighter than naan bread, similar in flavour to Afghani bread, a flavour that reminds us a faintly of waffle cones. 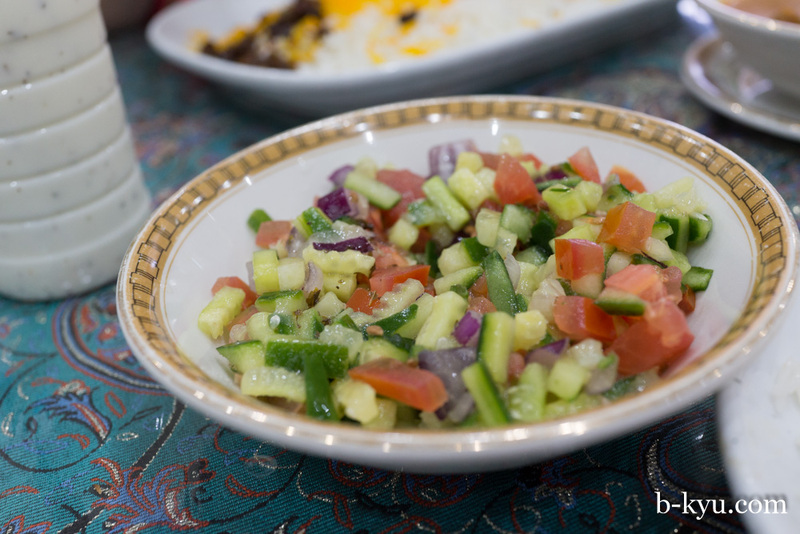 Shirazi salad - $4. Liven and lighten up your lunch with chopped tomato, cucumber and lime juice. As we leave the restaurant, a couple of patrons are outside chatting. "It's great food isn't it" they call out. We rub our full bellies in reply, "Sure is!". 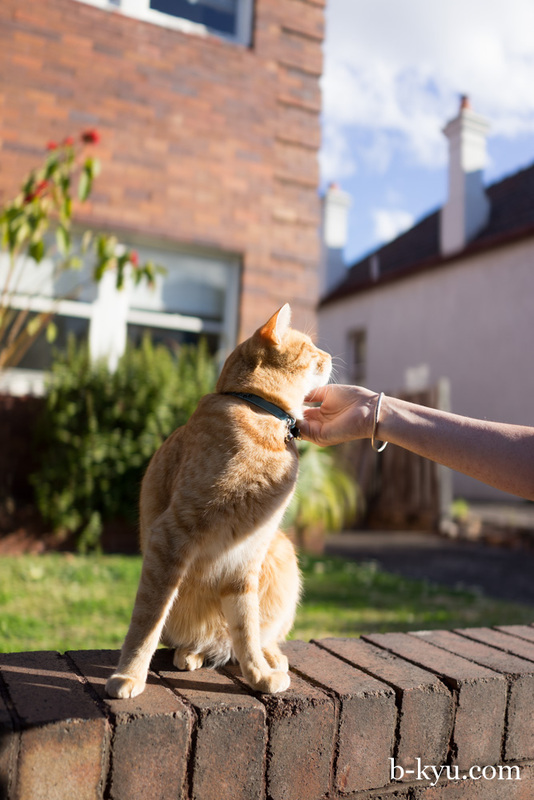 This post was brought to you by Mr Gingernut J. Pussycat of Summer Hill. Don't eat anything all day before you go!